Ruby Range Adventure has been guiding visitors to the Yukon and Alaska for many years. We bring unmatched experience and a genuine love of the North to every trip we lead. Our guides are qualified to lead you into the deepest wilderness and knowledgeable enough to explain the rich history of the communities that dot the landscape. We are a Yukon-based wilderness tour operator with ties to the region since our beginnings back in 1984. Since those early days, we’ve grown into a successful eco-tourism company that supports the region we work and live in, while bringing more and more visitors every year to an area we are proud to call our home. 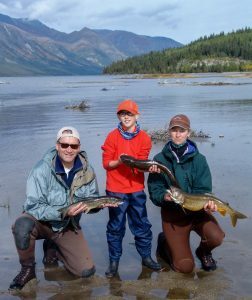 Our experience includes guiding groups down the Yukon, Teslin, Big Salmon, Wind and Snake Rivers, leading outdoor lovers through the vast sub alpine into majestic ranges that include some of North America’s largest mountains and bringing hundreds of travelers closer to the rugged face of Mother Nature than they’ve ever been. We’ve shared our knowledge with travelers from all over the world and even helped in the production of documentaries on the area, all while working to ensure the pristine beauty of the region remains just that — pristine. The environment is what our livelihood is based on, so we work to protect the very special balance between man and nature while providing you with a true northern natural experience. Because we limit the size of our groups, we are able to guarantee exclusive, one-of-a-kind experiences that will stay with you throughout your life. The small groups also help us ensure the environment goes unharmed. Our expertise goes beyond just guiding. We coordinate airport transfers, set-up hotel accommodations and take care of many more individual needs, such as reservations for ferries and trains or organize flights with bush-planes and helicopters. We provide the larger equipment needed for your journey, from canoes to tents to cooking and camping equipment. All you need to bring is your excitement, your desire to see a world few ever get to see up close and the basic necessities for whatever trip you plan to take with Ruby Range Adventure. If you are not sure what you need, simply ask us, and we will provide a list of everything you need to safely and comfortably enjoy your trip. We can even tailor trips to your desires. Remember, we have been doing this for years, so use our knowledge and experience to your advantage. We are available to answer questions, no matter how big or small your concern. That’s what Ruby Range Adventure offers you, the chance to take a unique and unparalleled journey through the True North of the Yukon and Alaska. We save you the effort of organizing and arranging an itinerary while making sure you see the very best the region has to offer.